Ernst Licht is a leading traditional German Bavarian clothing company offering a full range of traditional German clothing and Oktoberfest clothing inspired by the various cultural regions of Germany. Ernst Licht’s designing skills bring you German dirndls, lederhosen, and other German costumes with touches of today’s latest fashions, preserving the heritage and style of German traditional clothing. 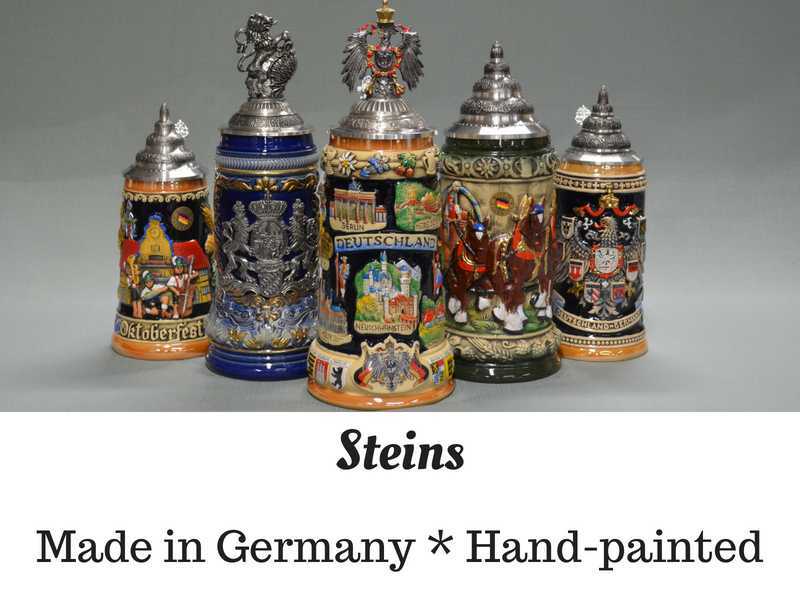 Ernst Licht has full variety of German Trachten apparel and German novelty gifts including traditional men’s Oktoberfest costumes, Bavarian women’s clothing, German hats, German hat feathers, edelweiss jewelry, beer steins, Oktoberfest music, and much more! Ernst Licht has sourced its design concepts from the traditional Bavarian and Alpine regions of Germany, providing a truly authentic tracht feel to meet all of your Oktoberfest outfit and German costume needs. High quality fabrics and impeccable embroidery provide a modern comfort to traditional German clothing. Our men’s collection includes men’s bundhosen, German plattlerhosen, men’s Trachten shirts, Miesbacher jackets, German suspenders, Germany men’s belts, Miesbacher shoes and Trachten socks. 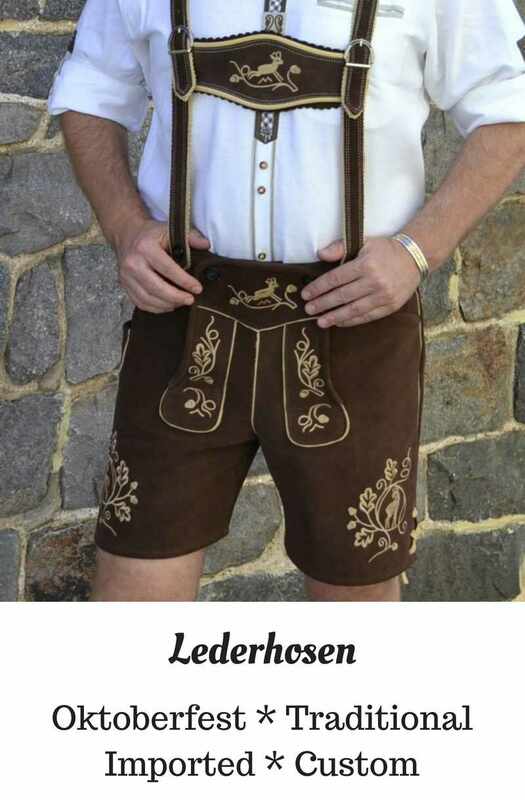 We are also happy to provide a collection of men’s German lederhosen to best fit your individual taste and style! German ties,German suspenders, German men’s hats, alpine hat pins, genuine gamsbarts and German hat feathers are also available at competitive prices to best complement your clothing selection. For women, we offer vibrant and colorful German dirndl dresses and Oktoberfest dirndls to suit your personality through unique color and fabric combinations of skirts, bodices, traditional German blouses and German aprons. The entire collection has been inspired by rich cultural German traditions and provides the best quality traditional Bavarian dirndl dress! 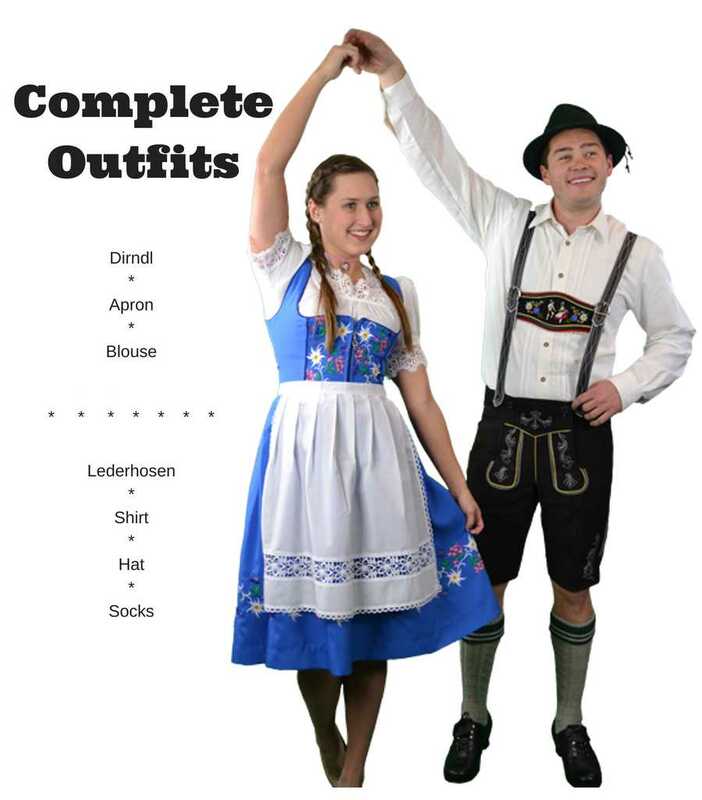 Besides Oktoberfest dirndls and German dirndl dress, there is also a full variety of lederhosen, women’s Trachten mieder, ladies pettipants, spencers, ladies German leather belts, traditional Alpine hats, ladies Miesbacher shoes and Trachten knee socks for women. 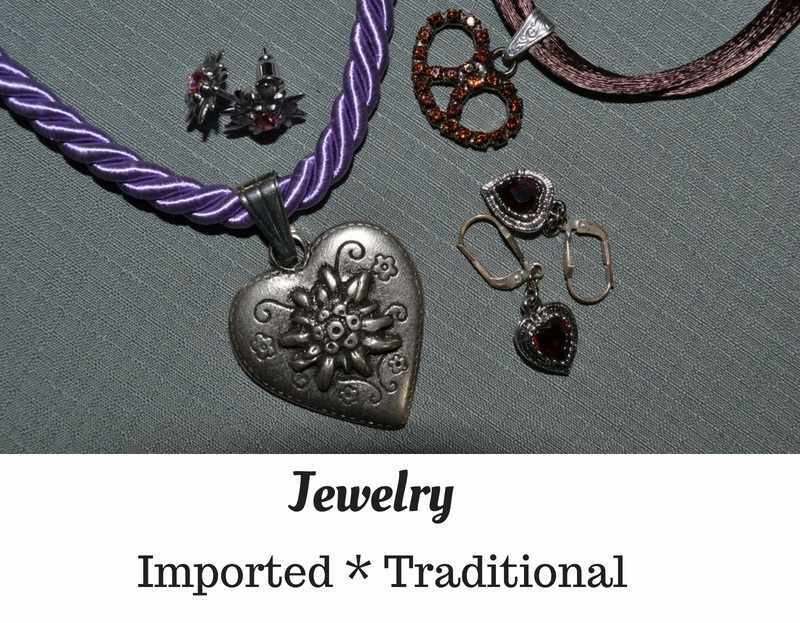 Traditional German earrings, edelweiss earrings, German necklaces, German stick pins, apron pins and other authentic jewelry are available in many styles to complement your choice of German traditional clothing. We also have a full line of children’s bundhosen, children’s lederhosen, children’s dirndls, authentic German gifts, German beer steins, Oktoberfest music and traditional German music CDs, German novelties and accessories to offer! Ernst Licht has designed fine German Oktoberfest clothing such as Oktoberfest dirndls and Oktoberfest lederhosen, imprinted with the rich heritage of Germany. Our Oktoberfest dirndl dresses have been designed with unique German zest so that the real festive spirit of Oktoberfest is felt with every wear! We serve some of the best traditional Bavarian dirndl dress and lederhosen outfits and Oktoberfest costumes in the perfect blend of quality and fashion! Come here and live up the real tracht!